State Lawmakers Allege Utility Companies Are Using Non-Disclosing Groups To Help The Lawmakers’ Campaign Opponents. LANSING (MAY 10, 2018) — Two lawmakers running for the state Senate say utility companies are using secretive groups to target them. The groups don’t have to disclose where their money is coming from. And it’s not even Mother’s Day. Later this year, Michigan voters will choose candidates to fill all 148 seats in the state Legislature. With three months to go before the primary election, TV and radio ads about contenders have already begun. Among the top spenders on state legislative ads have been two nonprofit organizations that don’t have to report their contributors’ names to the public. That's already causing tension and questions about who's behind the ads. One of the groups, Faithful Conservatives for Michigan, was incorporated in January, according to state records. It’s been airing ads on radio, broadcast TV and cable TV touting former Rep. Kevin Daley, a Republican from Lum, as a “conservative farmer” who values “fiscal responsibility” and “hard work.” Daley is running for the state Senate this year. The Michigan Campaign Finance Network has tracked an estimated $103,000 in ad spending by Faithful Conservatives so far. The other group, Citizens for Energizing Michigan’s Economy, uses the same address that Faithful Conservatives uses on state filings and has been airing an estimated $58,000 in radio ads in the Lansing area. The ads promote state Rep. Brett Roberts, a Republican from Eaton Township. Roberts is also running for the state Senate. Both sets of ads are so-called “issue ads.” The ads about Roberts ask listeners to thank him for supporting a “Michigan-first energy law.” The ads about Daley ask listeners to call their legislators to tell them to support a package of bills on environmental permitting and rule-making that the ads say would benefit farmers. “So when a child asks a parent if they can be a farmer like conservative Kevin Daley, the answer is yes,” the ads say. 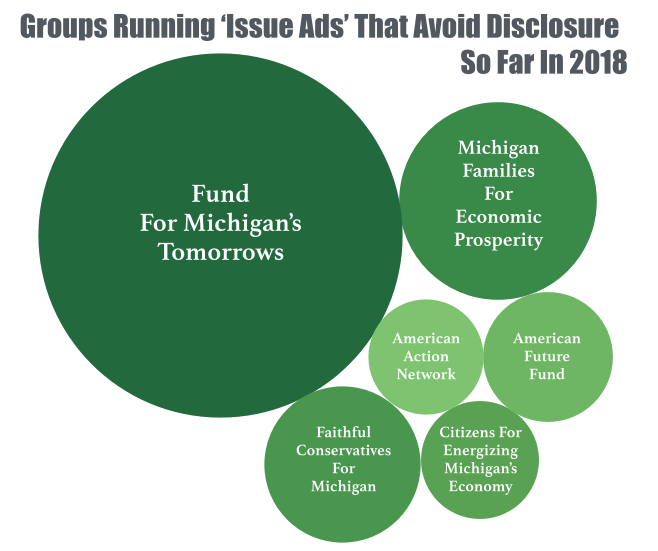 Under Michigan’s campaign finance laws, groups airing ads that talk about issues and avoid expressly telling viewers to support or oppose a candidate don’t have to disclose their donors. Eric Doster, a long-time campaign-finance and election attorney, is working for both Citizens for Energizing Michigan’s Economy and Faithful Conservatives, according to filings. Both groups have used his law office's addresses as their addresses on public documents. But Doster wouldn’t say much about the groups. On the other hand, candidates running against Roberts and Daley this summer allege that the ads are being funded by utility companies who don’t like their stances on energy policy. The candidates running against Roberts and Daley opposed a wide-ranging energy law overhaul supported by major utilities in 2016. Rep. Tom Barrett, a Republican from Potterville, is running against Roberts in the 24th Senate District. Rep. Gary Glenn, a Republican from Williams Township, is running against Daley in the 31st Senate District. Both Barrett and Glenn have also advocated for changes to state energy laws that the state’s dominant utility companies have opposed, including opening up a larger portion of the state’s market for competition from alternative suppliers. One of Michigan’s major utilities, Consumers Energy, has previously been tied to Citizens for Energizing Michigan’s Economy. In February 2014, a Consumers Energy spokesman told MLive that at the time, Consumers had used shareholder dollars to support the group, according to an article. At that point, the nonprofit was airing TV ads about issues before the Legislature. 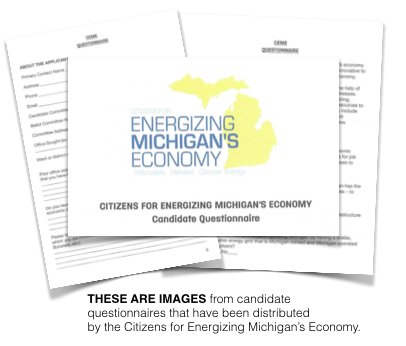 Three publicly listed officers for Citizens for Energizing Michigan Economy include two former Consumers Energy employees: Ronn Rasmussen, is listed on a 2017 filing as the group’s treasurer; and David Mengebier, is listed as the group’s vice president. Asked if Consumers is still funding the organization’s efforts, Katie Carey, director of media relations for Consumers Energy, wouldn't say. Both Citizens for Energizing Michigan’s Economy and Faithful Conservatives are social welfare organizations that fall under Section 501(c)(4) of the Internal Revenue Code. According to public documents, a group of CMS Energy shareholders pushed for a vote earlier this month on whether the company should more fully disclose information on its corporate political spending. CMS Energy’s Board of Directors opposed the proposal, and it failed. Matt Kasper of the Energy & Policy Institute first reported on the vote. A spokeswoman for Michigan’s other top electric utility, DTE Energy, provided a similar response to the one from Consumers. 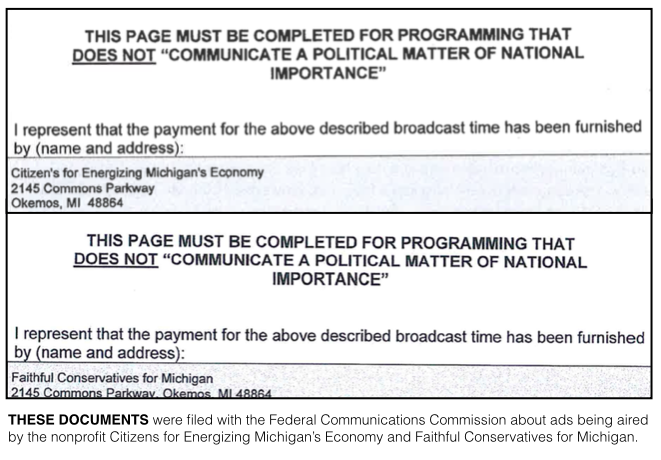 According to a public filing, Citizens for Energizing Michigan’s Economy had also reserved ad time on an AM radio station in Glenn’s area in mid-April. But the group canceled the order. Later in the month, Faithful Conservatives for Michigan began reserving time on radio, cable TV and broadcast TV in Glenn’s area. Because Faithful Conservatives is a relatively new group, it’s more difficult to figure out its connections. Doster wouldn’t disclose who’s on the group’s board of directors. Faithful Conservatives doesn’t have to say where its money is coming from. And there’s currently no public document that can prove whether a utility company is or is not providing financial support for the new organization. Apparently, former Rep. Kevin Daley, who is mentioned in the ads, doesn’t even know who’s behind the ads. While the ads feature images of Daley, Daley’s campaign manager Chris Tuski said the images in the ads were pulled directly from Daley’s campaign website. “We have no idea who is running the ads about Kevin,” Tuski said. On Wednesday, Glenn said he’s now pursuing legislation that would require any entity that is guaranteed by law a certain percentage of market share in Michigan to disclose any money it spends on issue advocacy. The current senator for the 31st Senate District, term-limited Sen. Mike Green, a Republican from Mayville, reported spending just $319,163 on his re-election bid in 2014.